Ogura’s new small size/high torque electromagnetic clutch helps VMAC’s aftermarket UNDERHOOD™ LITE air compressor meet performance and cost reduction goals previously unobtainable. Today’s commercial van manufacturers are changing the game by delivering new Euro style vans to North America. These new platforms boost fuel efficiency and increase cargo space dramatically. Ford’s 3.7 L Transit, Mercedes Benz’s 3.0L Sprinter, and the Ram 3.6L ProMaster are but three of the new entrees causing shakeups in the mobile service industry. While these vehicles offer state of the art engines, reduced emissions, and roomy vehicle platforms, they have drastically reduced the amount of available under hood space usually allocated for engine driven aftermarket components such as; air compressors, secondary alternators and hydraulic systems. Generally, mobile service businesses and municipalities buy these vehicles and outfit them with engine driven accessory systems for the many important tasks they do every day. Although there is limited engine compartment space available, most vans have an option to mount a secondary alternator. 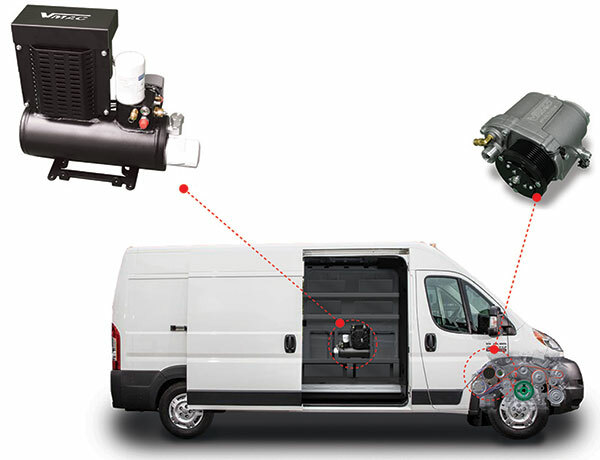 Dual alternators are used in many vans that are converted into ambulances or emergency vehicles to meet those specialized vehicles’ electrical needs. VMAC’s challenge was to try to fit a compressor into the space of an alternator. North American commercial vehicle regulations have made the vans a necessary option for many fleet managers and these vans are being used more and more in the mobile service industry. Unfortunately they lack a viable option for running air tools. The choices had been limited to very small CFM electric compressors and gas engine powered compressors mounted in the van that take up significant room, must be vented for exhaust and gas fumes (many of which are done improperly) and poses safety hazards while filling the fuel tank. With engine compartment space becoming harder and harder to get, manufacturers of air compressor systems like VMAC (Nanaimo, Vancouver B.C.) were faced with the significant challenge of designing a system for this growing market that would fit into the small location usually reserved for the small second alternator. 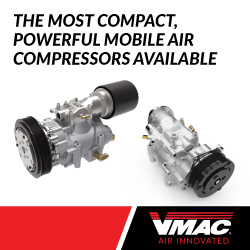 Traditional engine mounted air compressor systems such as VMAC’s industry leading UNDERHOOD™ 70 CFM system, simply would not fit on these new platforms. Revolutionary compact packaging ideas were demanded in three areas; the air compressor, its electromagnetic drive clutch/pulley and its oil cooler/separator. Even though VMAC is the only complete rotary screw compressor manufacturer in Canada and one of the few in North America, the first challenge was fitting the compressor in a space design for a vehicle alternator. VMAC had to start with a blank slate and broke a number of traditional compressor design norms to achieve the goal. A unique, patented air intake through the front of the rotors helped keep the envelope size compact. Eliminating the inlet valve and using a check valve to replace it also reduced space and simplified the design. As in life, timing is everything. 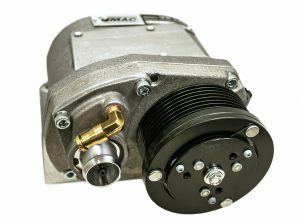 The call for a smaller air compressor began coincidentally, back in 2009 when VMACs loyal customers, through their dealer network, demanded a smaller, half cost, and half output version of their popular UNDERHOOD™ 70. This was well before the introduction of the new Euro style vans into the North American market, but its 2009 start gave VMAC a fortuitous five-year head start to perfect a solution for a problem that didn’t even exist at the time. 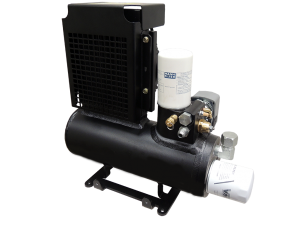 It was this market driven demand for simple ½ air, ½ cost system, that lead to today’s smallest high performance air compressor; the UNDERHOOD™ 40 rotary screw air compressor system. “It was a crisp fall day in 2009 at the Kiwi Lodge in Nanaimo that VMAC’s Dealer Advisory Group challenged VMAC to design an UNDERHOOD™ Air Compressor that was “half the cost and half the output” of the UNDERHOOD™ 70. As a company staffed with design engineers and a state of the art manufacturing facility, the gauntlet had been thrown down and was quickly picked up. The challenge would involve many aspects of the entire air compressor system, not just the individual components as a reduction in output of a rotary screw compressor does not necessarily mean a cost reduction. A key design feature of the 70 CFM system is the addition of a dedicated second pulley (and belt) mounted to the OEM engine crank pulley. This feature is designed to handle side-loading issues on the accessory bearings in the belt line. A smaller output compressor would likely not affect the OEM components loads as such. The necessity of running the compressor off of the existing OEM single accessory drive belt was born. A team of engineers were tasked to use an existing UNDERHOOD™ 70 compressor and create a prototype of a gearless version to meet the lower output and lesser cost portion of the scope. This was quickly done and a quick bracket design was manufactured to mount on one of the company vehicles to see if using the OEM belt was feasible. Initial testing proved that this concept was a winner in terms of reducing the number of components, cost of the compressor and reducing the output. The challenge was the size of the compressor was still somewhat large to mount in areas to take advantage of using the OEM belt. VMAC’s newly formed Product Development Department was given the task of building a compressor that met the entire scope. Small, cost effective, 30-35 CFM and able to deliver the results VMAC’s Dealer Network demanded. Not wanting to make it easy, VMAC’s President Jim Hogan threw a couple of last-minute twists into the project. First, design the compressor to fit in the 2nd alternator position of the very space limited Ford SuperDuty 6.7L PowerStroke Diesel. Simple, right? Second, as an admirer of Francis L. Zrostlik’s (co-founder of Iowa Mold Tooling and Stellar Industries) early under the hood reciprocating compressor design, Jim also requested that the new VMAC compressor system borrow heavily from the very simple controls and operation of those early compressors. Another key to the compressor design was simplifying the controls. VMAC decided to cycle a unique Ogura clutch to control the compressor and also to reduce cost, size, weight and the number of components being used. This option was chosen and implemented to meet Jim’s second challenge of emulating a reciprocating control system. The clutch itself was a custom prototype built by Ogura, the world’s largest manufacturer of electromagnetic clutches. 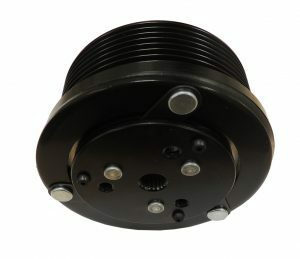 Unique in its design, this high torque clutch utilizes a very small diameter 85 mm pulley that enables the compressor to be effectively geared higher to reduce the offset in diameter of the OEM crank pulley in relation to VMAC’s 70 CFM designs. Ogura and VMAC have worked together for over a decade to provide “best in the business” electromagnetic clutches for UNDERHOOD™ 70 air compressors. When VMAC tasked Ogura with this new challenge, Ogura went to work to design the world’s first 85 mm OD, 8 groove Poly V production clutch, capable of driving the anticipated pump loading (>15NM) while cycling flawlessly at running speeds exceeding 7,000 RPM. The clutch components and bearing design are viable for up to 10K RPM continuously, providing plenty of safety margin. The 7,000 RPM pump requirement is the result of the ratio between the clutch 85mm pulley and the crank 200mm diameter (typical) and the engines RPM redline. These high compressor speeds were necessary to drive the compressor rotors one to one with the drive pulley (there is no internal compressor gearing). This gearless design works to cut costs, improve life expectancy and simplify assembly. Typical engine mounted automotive clutches (such as the popular AC compressor clutch) use multi-pole flux directing technology to increase magnetic clamping forces. 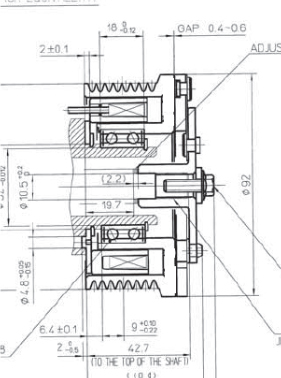 It is this magnetic clamping force which creates torque to transmit power from the pulley to the compressor. Most multi-pole clutch flux directing techniques incorporate circumferentially linked air slots together with low carbon steel radial spokes evenly spaced in the clutch rotor (pulley input) and armature plates (output to air compressor) for strength. While the steel spokes add radial strength to the pulley, they are a short (circuit) to the flux path. This short (circuit) reduces the efficiency of the magnetic system, and would yield lower torque from the clutch (lines of magnetic flux will pass through steel faster than through air). For higher torque, Oguras MAE-MG43 clutch does away with traditional flux directing techniques by completely eliminating the steel structural spokes, replacing them with a structurally strong, but magnetically neutral material creating a near 100% efficient magnetic circuit. It is this marked increase in magnetic efficiency, with multipole technology that allows Ogura clutch to transmit the torque of a clutch nearly twice its size. The Clutch rotor is supported by a special NSK custom designed 47 mm OD double row ball bearing, lubricated for life. The unique snout mount bearing design keeps raceways constantly in motion and properly lubed (wither the clutch is engaged or not). The snout mount design eliminates bearing brinelling issues caused by extended engage times in some earlier clutch designs. To help with quick assembly, disassembly (if needed) and solid torque transmission to the pump, Oguras JIS splined armature hub bore is center-tapped for easy installation to the pump shaft. The control system was simplified to include only basic components. An on/off, temperature and pressure switch and indicator lamp, two relays, as well as a simple one speed throttle. With the compressor and control system designed, the next step was set in motion. With compressor in hand, VMAC engineers quickly designed a small bracket for the 6.7 PowerStroke and indeed fit into that alternator position. Challenge received and answered with a resounding success. However, the project was still not complete. Just designing a new compressor to fit into tight spaces did not necessarily address the entire cost picture. With the Ogura clutch prototypes designed, delivered, and in test, VMAC concentrated on the final parts of the new system. One of the areas VMAC could improve cost to the final customer would be designing components that would ease the install and reduce the time it takes to complete the job. The Product Development team went to work again and revisited some older experiments to see if any ideas would jump out. Indeed one idea of integrating cooling and oil separation into one package seemed to fit the bill. Various designs were built and tested until a final candidate worked remarkably well. VMAC’s introduction of the WHASP Tank was worthy of another patent as the company broke the mould on traditional thinking. Using this new tank removed the need for integration into the vehicle’s cooling system, moved both components to one place and made for a very quick install. As a side note, one of the first, non-VMAC installers to work with the system took a mere five hours from start to running the compressor on a 6.7L installation. The reduction in install time alone saves the end user a significant amount of cost. With the major components finalized, VMAC then turned to a few of its selected dealers to move the product into the market. This is when the pleasant surprise of a new major market was found with the introduction of European style vans into the North American market. Looking back to that day in 2009 and the challenge thrown down by the advisory group, VMAC feels that the UNDERHOOD™-Lite together with its awesome Ogura clutch will enable its dealers to install a state of the art, cost-effective rotary screw air compressor system under the hood of mobile service vehicles for current markets and new ones yet to come. Ogura Industrial Corp’s Regional Manager -- Fred has been selling clutches into technical applications since forever (like 1980). Fred considers the Ogura Clutch business with VMAC to be one of the finest achievements of his career.